Sarah E. Goode was one of the first African-American women to get a US patent. Working in her furniture store, she recognized a need for a multi-use bed and through hard work, ingenuity, and determination, invented her unique cupboard bed. She built more than a piece of furniture. She built a life far away from slavery, a life where her sweet dreams could come true. Vivian Kirkfield Vivian Kirkfield has a master's degree in Early Childhood Education and taught kindergarten in New York City. 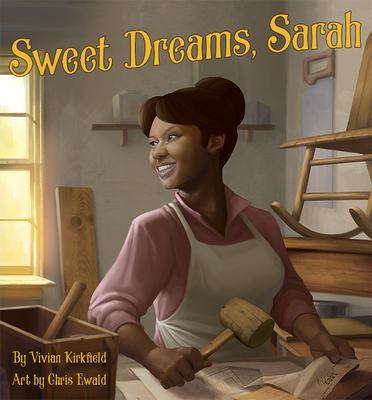 Sweet Dreams, Sarah is her first picture book. For more information about her, go to viviankirkfield.com Chris Ewald Chris Ewald studied art at the Virginia Commonwealth University in Richmond. He works on digital games and animation which is showcased on his website, chrisewald.carbonmade.com.